Imagine your vacation in a family oriented community that has something for everyone: indoor and outdoor pools, playgrounds, basketball, shuffle board, miniature golf, and a mile of beach all within our gated community. Life guards, patrolling security/courtesy service, and a 10 MPH speed limit make this a really safe vacation place where you can just 'let the kids go'. E-8 is fully equipped and furnished to make your stay a pleasure in every way. 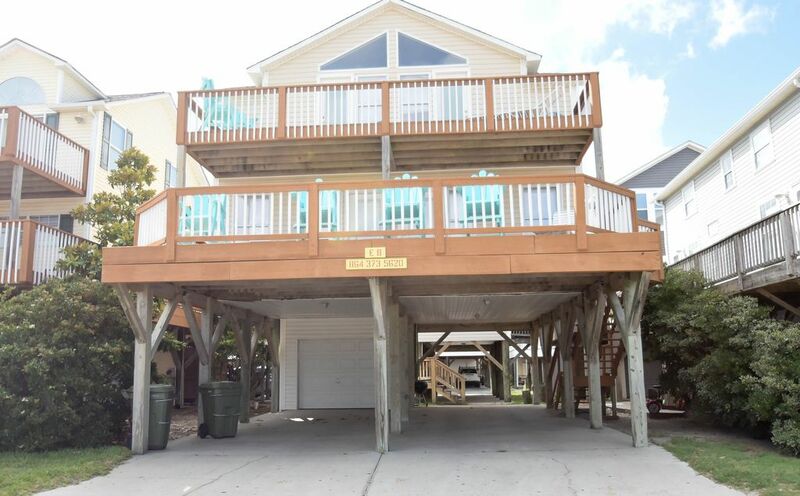 The house has two large decks with parking for 4-5 cars underneath. It is conveniently located just across from the beach, volleyball, playgrounds and steps to the basketball courts. Just a block or so away is the recreation area where you will find pools(indoor, outdoor olympic, splash pool and kid zone pool/area) as well as a cafe, arcade, indoor ping pong tables, etc. Our recreation department offers discount prices and tickets to local area attractions and movie theatres. They can assist you in arranging tee times for golf and offer discounts for Prestwick Golf Course. There is a summer camp program for children in the mornings and other events for the entire family on a daily basis. These and many other features from golf cars to hand dipped ice cream make Ocean Lakes a great place to bring your family, extended family and friends for vacation memories that will last a lifetime. Give us a call about this or one of our other ten oceanfront or ocean view houses and start making memories this summer. Linens are included for weekly stays during the peak season. Please call to verify 'peak' weeks. WiFi is provided for free at the house and is also available at the snackbar, the recreation center. Limit 2 devices at a time to ensure fast link. We're so glad you enjoyed your stay! We look forward to having your family stay with us again in the future! The house was great and had a beautiful view of the beach. Great for families! Something for EVERYONE. Our family had an amazing time at E8! Location was perfect. Directly in front of the beach, the playground, the basketball courts, and volleyball net. The water park and rec center is around the corner. We were 7 adults and 5 kids ranging in age from 8 to 70’s and no one was ever bored. You couldn’t ask for a better location! The house was perfect for the 12 of us. Roomy and comfortable. The property was clean and simply decorated which is great when you have young kids. We didn’t have to worry about them breaking or ruining anything. We felt right at home. Several supermarkets and Walgreens nearby. Lots of things to do within a 20 min ride. But we barely left Ocean Lakes. It was the best lazy beach vacation ever! We didn’t have any real issues and when we did contact Meghan she replied right away. We’re so glad you enjoyed your stay! What a sweet time for your family to spend together. We are happy to be a part of such fun memories! We welcome your family back any time! Great place. Perfect location for us. Great house. Great location. Beach front. Basketball court and playground right across the street. We were able to watch the golf cart parade from our deck. It was so much fun. We're so glad you enjoyed your stay! Thank you for taking the time to write a review! This house is so much fun and in a great spot for families with kids who are active! We hope to have you stay with us in the future! Great house! Enough room for everyone and across the street from the beach! It's on the campground Ocean Lakes, which is perfect. No need to really leave. Everything is on site. Thank you for the great review. We are so glad you enjoyed your stay and hope to have your family stay with us in the future! Welcome to the Sandy Beach Rentals family! This beautiful home exceeded our expectations. It was exactly as the photos/information describe it to be but the photos just don’t do it the justice it so deserves...it really is an absolute dream! On the day we were to check out, we called to check availability and were able to stay for one more night...we just couldn’t say goodbye! The home itself is perfectly situated so that anything/everything you could possibly want to do or see is either a short drive (10-20 minutes) or walking distance within the grounds (Rec center, pools, ice cream parlor, arcade, shopping mart etc..). The beach and playgrounds are literally steps away from the door. Since we were able to apply discounts we earned from booking to some pretty great attractions, we took full advantage of such great deals by exploring Broadway at the Beach a couple of different times (only 20 minutes from the home) and the guys spent a day out on the links at beautiful Prestwick Golf Course (only 10 minute drive). We also spent some time at the Boardwalk at Pier 14 for some sightseeing and shopping. With all that was available, the majority of our time was spent at the beach house on those cool deck chairs, around the dining room table and at the beach together as a family. Meghann if this reaches you thank you a thousand times over for everything. Everyone I encountered at Sandy Beach and Ocean Lakes were great. But Meghann was so patient with me and all of my questions throughout the whole entire process and was simply amazing to work with...friendly, helpful and informative from start to finish. We have traveled and stayed in Myrtle Beach once before and we’ll never stay anywhere else now. Being able to watch the sunrise on the 2nd story deck right off of the bedroom was incredible... the true definition of vacation. We fell in love with E8 and will no doubt be back next year. My parents, sister and her family also fell head over heals. What a way for them all to experience the ocean for their very first time! It was a week we’ll always remember...one that we all needed. I am just so grateful. Thank you...all the way from Michigan, for a vacation we will never, ever forget! Thank you for the outstanding review. It is a pleasure to work with such kind and loving guests. We are so glad you enjoyed your stay and look forward to welcoming you again for your next visit! We have over 100 golf courses in the grand strand area. "The owner of this site is not affiliated with or sponsored by Ocean Lakes Family Campground, L.P., (the operator of Ocean Lakes Family Campground), Ocean Lakes Properties, The Jackson Companies or any of their subsidiaries." ALL SEASONAL RATES ARE "FROM" THE PRICE LISTED. Pricing may change during that seasonal period. There is no way to include that option on VRBO. Ex: During the late summer rate, it is listed as $2500/week. Our summer rate ranges from $3600 the first week of August to only $1600 the week of Sept. 17-24. PLEASE CALL FOR CONFIRMED PRICING. Linens are included during peak season.